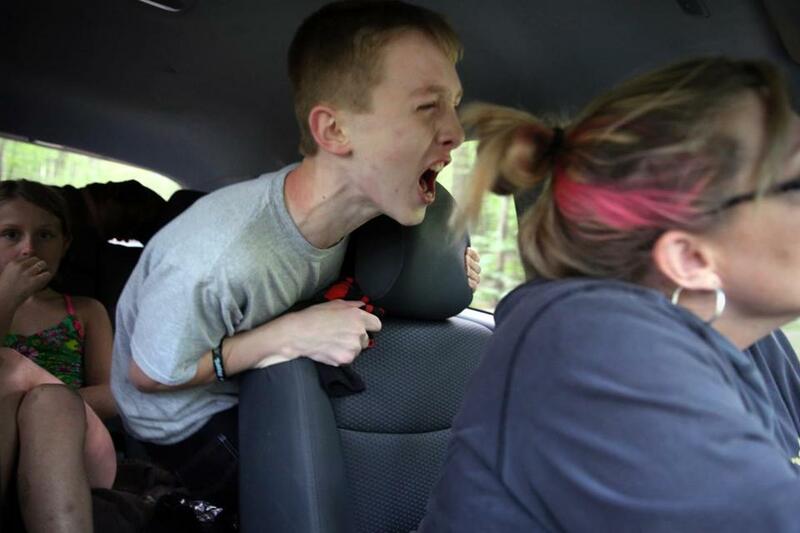 Connor Biscan yelled at his mother, Roberta, as they returned from an excursion during a family gathering in in Nelson, N.H. Connor had shouted an expletive at his sister, resulting in his first warning from his mother for the weekend. Ten warnings and Connor has to return to school. He begged his mother to take it back. “Take it back, please take it back,” he screamed in his mother’s ear. Connor’s cousin, Kara Quinn, 8, was at left. “It isn’t so much a rare place — as many as half of autistic children suffer from mental health problems — but it can be a deeply baffling one. The overlap between these afflictions is hard to untangle; diagnosis and treatment can be very difficult. And a health care system meant to help can instead be frustrating, even harsh,” Kowalczyk wrote. Walker is a 30-year veteran photojournalist who has already won two Pulitzer Prizes for feature photography. Raised in Pennsylvania, he went to the Rhode Island School of Photography and began his career at the Marlborough Enterprise and the Berkshire Eagle in Massachusetts. He joined the Denver Post in 1998, winning Pulitzers in 2010 and 2012. He joined the Globe in 2015. “What makes Craig special is his commitment and, really, his relentlessness. When he gets into a story, he leaves no stone unturned. He is very passionate about social issues and is driven to embed and stay as long as necessary to tell a story completely and accurately.” said Globe director of photography Bill Greene. Walker got the news while he was out covering the scene at the Heartbreak Hill section of the Boston Marathon course. “It’s an honor to be included,” he said by cellphone.